On May 21st, Houkago Princess Staff and its members revealed that there would be an important announcement made during their Pre-Release event for Seishun Mermaid on May 22nd at Akiba Sofmap. Finally, the news was revealed online, with the announcement regarding the 2.5th generation member, Miyashita Mayuka. It has been decided that, for Miyashita Mayuka, Seishun Mermaid will be her final single as a member of Houkago Princess, as she has decided to graduate the unit come the month of July. In her tweet regarding the announcement, she reveals that the dates have yet to be confirmed, however she will let everyone know once her final performance day has been decided. She also went on to thank her fans, and that she hopes they will support her for the next two months as a member of Houkago Princess. ... In regards to my thoughts about this, I'm not going to say that I'm shocked, really, because I expected it. When it was revealed that an announcement would happen today, I knew it would be a graduation announcement. In the back of my mind, I had a feeling it would Mayuka's graduation announcement. That, or they would announce an album release. Of course it was the former. I'm not surprised though. As I said, I was expecting it, mostly because Mayuka's been suspending her activities a lot this year due to hospital appointments and issues with her voice. It's been going for about a year or so, actually, so really, I'm not that shocked by this announcement at all, just very, very sad, because it's Mayukyandi, and she's been in the group for a very long time, despite that her Graduation back in May 2012 and her subsequent return to the group in March 2013. But I do understand why she is leaving, and honestly, it might be for the best. Given that she aspires to voice act, Mayuka;s voice is really important to her, and given all her recent issues have been to do with her voice... well, you get what I mean. Graduating is probably the best option for her right now, and honestly, it's not like she hasn't has a good run as an Idol. She's a semi-front girl, she sings a solo in almost every song she's been in, and she's pretty popular and well-liked. 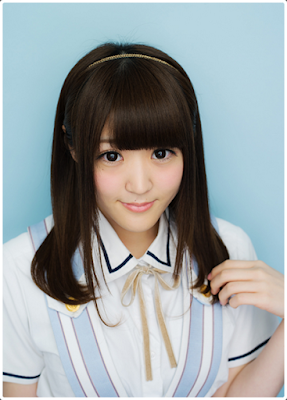 She's also got two solo songs under her belt as a member of HouPri, and is one of their better vocalists next to Maika. So yeah, she's had a good run. I will be sad to see her go, though not as devastated as I was with Mihotan, but I will cry. I have cried, in fact. I mean, I like Mayukyandi, she's a great Idol and most likely an amazing person to boot, and I'll miss seeing her in photojackets and MV's and hearing her wonderful voice, but I know it's her time to leave. I'm just happy she was able to watch Houkago Princess grow, and to see them major debut. I'm happy Mayukyandi was a part of the group. I'm so sad to see you go, but I know this is most likely the right thing for you right now, MayuKyandi. Until your final song, please treasure your last two months within HouPri, and we in turn will treasure our last two months with you standing on that stage.